KUALA LUMPUR (Mar 27): The FBM KLCI pared some lots loss at the midday break today as regional markets traded mixed. 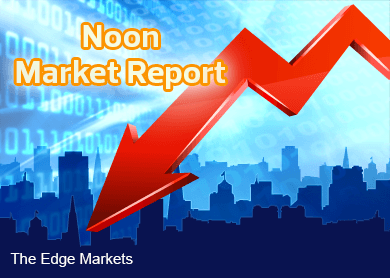 At 12.30pm, the FBM KLCI was down 0.96 points to 1,817.46. The index had earlier dipped to its intra-morning low of 1,813.30. Losers edged gainers by 330 to 267, while 352 counters traded unchanged. Volume was 814.61 million shares valued at RM679.56 million. The top losers included British American Tobacco (M) Bhd, DanaInfra Nasional Bhd, Far East Corporation Bhd, Allianz Malaysia Bhd, Malaysian Pacific Industries Bhd, Guinness Anchor Bhd, Nestle (M) Bhd, WZ Satu Bhd, Top Glove Corporation Bhd and Tenaga Nasional Bhd. The actively traded stocks included Ingenuity Solutions Bhd, Perisai Petroleum Teknologi Bhd, KNM Group Bhd, Privasia Teknologi Bhd, APFT Bhd, Jadi Imaging Holdings Bhd, Jasa Kita Bhd, Sumatec Resources Bhd and Wintoni Group Bhd. The top gainers included Dutch Lady Milk Industries Bhd, Kuala Lumpur Kepong Bhd, Super Holdings Bhd, Petronas Dagangan Bhd, Hong Leong Financial Group Bhd, Coastal Contracts Bhd, DKSH Holdings Bhd and Petronas Chemicals Group Bhd. Asian stocks were mixed on Friday as rising tensions in the Middle East obscured the investment outlook, while the dollar rebounded, according to Reuters. Crude oil prices were lower due to the dollar's bounce and as the market reassessed the potential impact of the escalating conflict in Yemen, where Saudi Arabia and allies carried out air strikes on Iranian-backed Houthi rebels on Thursday, it said. Maybank IB head of retail research and chief chartist Lee Chong Hooi in a note to clients today said he recommended a “Range Trading” stance for the index. Lee said the KLCI Apr Futures moved into a 4.92-point discount against the FBMKLCI. “We expect some buying at the supports of 1,797 to 1,818, whilst heavy liquidation activities may cap rebounds at the resistances of 1,820 and 1,845. “The index was volatile after heavy foreign selling emerged in Nov and it plunged to a fresh low of 1,671.82 on Dec 17. “The rebound from the 1,671.82 low stalled at 1,831.41 (Feb 4). In view of the volatile DJIA trend at lofty levels, it will be very wise to trade the FBM KLCI between the stipulated support of 1,774 and resistance of 1,831,” he said.